San Antonio, Texas — Oregon cowgirl Amberleigh Moore calls her great mare Paige a perfectionist. It’s hard to argue with her assessment, especially in the early going of 2017. After taking a nasty spill when a leather strip on her latigo broke during her second round run at the Fort Worth Stock Show and Rodeo on February 4, Paige and Moore have been nearly perfect inside the arena. Moore shook off the fall—despite being knocked unconscious—and competed in the Championship Round later that same day, earning $4,250 during the rodeo. Since then, Moore and Paige are undefeated. The pair won first in Belton, Texas, for $2,466, besting the field by nearly three tenths of a second. They also won first in Jackson, Miss., adding another $5,941 to their yearly total, bringing their ten day haul above $12,000. Moore is also in line for more dough at the San Angelo (TX) Stock Show and Rodeo—she won the second go round for another $4,988 and is leading the average, after already winning $1,900 in the opening round. The finals are scheduled for Friday, February 17. All the excitement, which followed a tough start to the season in which Moore got snowed out of the National Western Stock Show in Denver and caught a bad flu in Rapid City (SD) before the fall in Fort Worth, led to the reigning WPRA Reserve World Champion riding a big high into her first appearance at the San Antonio Stock Show and Rodeo. One of the huge winter stock show rodeos, San Antonio is a tournament style rodeo with a limit of 50 competitors in each event. The rodeo is divided into brackets of 10 contestants each and each bracket holds three rounds of preliminary competition. At the end of the third round, the top four money winners from the three rounds (no average money is figured or paid) advances to the semi-finals. Each of the two, ten-contestant semi-finals is comprised of two more rounds, paying more than the preliminary rounds and contestants again vie for round money to add to their bracket earnings. The five highest money winners from each semi-finals will move on to the finals, February 25. Because money won is critical to continuing advancement through the rounds at San Antonio, a big performance in her bracket can set a competitor up well as the rodeo progresses. Moore definitely took care of that during her three runs in Bracket 3 held February 14-16. In fact, she stayed undefeated, winning all three rounds. Paige the perfectionist turned in round winning times of 14.13, 13.98 and 13.99 seconds to earn Moore three straight victory laps and $6,843. She even managed to squeeze in a trip to the Alamo during her time in the Alamo City. Moore easily moves on to the semi-finals and will be joined by fellow Wrangler National Finals Rodeo cowgirls Jana Bean and Pam Capper along with Badlands Circuit Champ Cally Thomas. Bean won second behind Moore two of three nights while Thomas and Capper picked up three checks each to punch their tickets to the semi-finals. 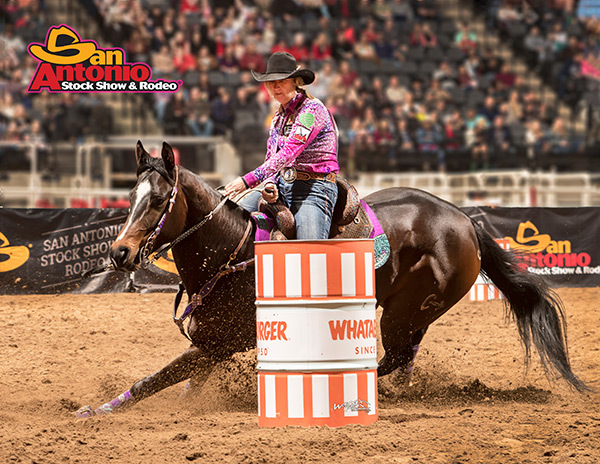 Bracket 4 begins Friday night, February 17 with two-time San Antonio Stock Show Champion—and $3 million cowgirl Sherry Cervi as well as 2016 San Antonio champ Michele McLeod along with 2016 WNFR cowgirl Kimmie Wall joining current WPRA World number two cowgirl Kathy Grimes. The final bracket of preliminary competition begins Sunday afternoon with the WPRA’s current leader Tiany Schuster joining WNFR cowgirls Benette Little, Kelly Yates, Brenda Mays and Jackie Ganter. The first of four semi-finals performances begin Tuesday, February 21. For more information on the San Antonio Stock Show & Rodeo, visit them on-line at www.sarodeo.com.